Hitler versus Picasso and the Others will be premiering exclusively at Eden Cinemas on Friday 27th April at 8.15 pm, with limited shows also on Saturday 28th and Sunday 29th April. In the 1937 the Nazi regime held two exhibitions in Munich: one to stigmatize “degenerate art,” and one, personally curated by Hitler, to glorify “classic art.” Narrated by Toni Servillo (star of Oscar® winner The Great Beauty), Hitler vs Picasso is an incredible journey through five exhibitions, displaying masterpieces by Botticelli, Klee, Matisse, Monet, Chagall, Renoir, and Gauguin. Linked to each exhibition are moving stories of those who witnessed the systematic destruction and looting of the day – from the Bernheimer family, who were forced to barter their freedom, to “Hitler’s dealer,” Cornelius Gurlitt, known to have hidden away some of the most priceless art treasures of the century. Revealing the Nazi obsession with art, Hitler vs Picasso offers viewers a rare look at condemned works that have finally come to light. 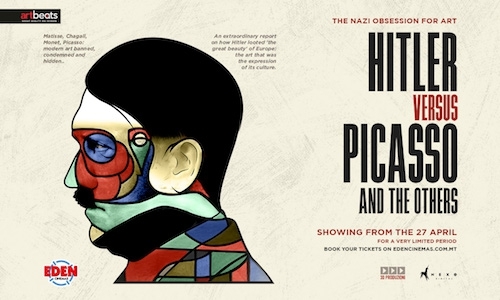 Tickets for ‘Hitler versus Picasso and the Others’ are priced at only €12. Visit www.edencinemas.com for online tickets and more information.